It is well-known that loanwords are a significant source of information about the cultural relation among the people on the stage of history. When we turn to prehistory, loanwords and other “borrowed” elements increase in importance as evidence of the prehistory of a people and its contacts with other peoples. Such linguistic data are often the best available evidence, even when it can be correlated with archaeological evidences. For some areas and periods, it is the only source of information. For this reason it demands and deserves to be approached in a systematic fashion (ANDERSEN HENNING. 2001: 1). When borrowing from one language to another, besides phonetic transformations, semantic transformations of borrowed words very often occur and the meanings of the words can vary from close to antonymic. Sometimes the transformation of meaning is unexpected, but, nevertheless, logical, what can be shown by such an example. We came to the conclusion that the creators of the Tripillian culture were some Semitic tribes. From the language of the Tripollians, which stood at a higher level of development, many words were borrowed by the neighboring Turks and Indo-Europeans. In this case, given the agricultural character of this culture, it can be assumed that in their language words existed like Hebrew דוחן (dokhan) “millet” and דגן (dagan) "grain, cereal", borrowed by the Türks in barter trade with the expansion of their semantic field. In modern Turkic languages, such words have adopted the meaning "grain", "seed, seed", "kin", "tribe". (Chuv. tăkhăm, Tur. tohum, Karach., Balk. tuqum, tuuğan, Kaz tuğan, Tat. tuganlyk, Turkm. dogan, tokhum, Gag. toom, Kurg. tukum a. o.). However, the words of this semantic field are difficult to separate from the native Türkic ones originating from the ancient Turkic. toγ- "to born", which is just like the Semitic words mentioned, the Nostratic legacy. Understanding grain as a commodity led to a rethinking of the word in this direction and in some languages could give a name to other commodities, such as salt, cattle, etc., cf. Chech. däkhni «property, livestock», Kab. dyžyn "silver". It is possible that in the Turkic languages some of these words after the metathesis took the form *tanag/täng and got the meaning "money" (cf. Chuv. tenkĕ "silver coin", Kaz. teŋge"coin, money", etc.). The compiled Table of lexical matches of the Indo-European, Finno-Ugric and Turkic languages and found habitats of the speakers of individual languages help us comparing them to study cultural relations of the population of Eastern Europe during the Chalcolithic and Bronze Age. Particularly relevant material can provide learning closer connections just those languages of different language families, areas which border each other, ie, Iran-Vepsian and Iranian-Mordvinic, the Armenian-Turkic and, in particular, the Armenian-Oguz (Gagauz), Mari-Turkic, Hungarian-Turkic and so on. In this presentation, with rare exceptions, the goal is not to etymologize correspondences and establish a language as the source of borrowing. This could be the next step of research by narrow specialists. The search for correspondences did not exclude the possibility that long-standing linguistic connections could be distorted by later borrowings and intrusions, as , for example, in the case of Germanic and Finno-Baltic languages. In this presentation, with rare exceptions, the goal is not to etymologize correspondences and establish a source of borrowing language. This could be the next step of research by narrow specialists. The search for correspondences did not exclude the possibility that long-standing linguistic connections could be distorted by later borrowings and intrusions, as is the case, for example, in the case of Germanic and Finno-Baltic languages. As can be seen from the location of the area of Veps in the common Finno-Ugric territory, the data of the Veps language is very important for the characterization of the Iranian-Finno-Ugric language relations. In Veps, there would have to be a significantly greater number of matches for Iranian words than indicated in the Table below. Nevertheless, there are very interesting examples of Veps separate ties with Iranian ones. Of course, this "separateness", as always, is conditional, since one can never be sure that other languages have no matches. Most of the Veps words in the table are Iranian loan-words, but in those ancient times, in the absence of a clear isolation of languages, contacts between neighboring tribes developed without regard to the linguistic affiliation of neighbors. New words spread with the same speed in all directions from their place of origin, if there was a real need for them. Therefore, those ancient borrowings are subject to the same distribution law as the words of closely related languages, although they cannot be considered isogloss in the full sense of the word due to the phonetic features of the languages of different groups. Nevertheless, it is more correct to speak not about borrowing, but about the foreign origin of individual words. In more recent times, with the growth of ethnic self-awareness and greater divergence of languages, additional barriers have already arisen in the way of the spread of new words. At the beginning of the 2nd mill. BC, when the Indo-Aryans, Phrygians, Thracians, and Armenians left their acestral areas, they were occupied by Iranian tribes, expanding the territory of their habitat, where the Proto-Iranian language was divided into separate dialects in ethno-forming areas (see map below). Settlement territory of the Iranic tribes in the II millennium BC. The location of the Baluchi area next to the Veps area would have to have the effect of the greatest number of common linguistic elements between the Baluchi and Vepsian languages, however, due to the lack of a large Baluchi language dictionary, it is impossible to verify this. However, the lexical matches found can be very convincing. For example, Vepsian word naine "daughter-in-law" corresponds well Bal. na’ānē "dauther" and janaine "woman". It is clear that with the dual-clan organization of the primitive society, when men had to take the wives of women from another kind, the same woman for the Baloch parents was the daughter, and for the family of her husband — the daughter-in-law. Thus, not only the lexical parallel, but such evidence of typical marriage unions confirm the proximity of the Veps and the Baluch. Perhaps Bal. pērok "grandfather" corresponds to Veps. per’eh "family". K. Häkkinen believes that Fin. paksu, Est. and Veps. paks "fat, thich" are Iranian loan-words, but he gives as match only Bal. baz "thick, dense" (HÄKKINEN KAISA>. 2007: 860). Of the other Iranian, the similar word is found only in Ossetian – bæz "fat, thick". The ancestors of the Ossetians and Baluchi were neighbors in the ancestral homeland. There is still not enough lexical material from the Baluchi language, but a comparative analysis of the Vepsian language with other Iranian languages ​​was carried out. As a result of this analysis, it turned out that the largest number of mutual words with Veps are present in Kurdish – 76, Ossetian has 65 mutual words with Veps, Persian – 62, Talyshi – 61 words, Gilyan – 56, Pashto – 45 common words. It can be seen on the map that the areas of the Kurdish and Ossetian languages ​​are the closest, except for the Baluchi area, to the area of ​​the Vepsian language, and the language contacts between the people of these areas should also be quite close. čirkištada "to drop" Kurd. çerk "drop"
čokaita "to stick" Kurd. çeqandin "to stick", Tal. čəgətəq "to prick"
čopak "deft" Pashto, Gil čabuk, Pers čabok "swift"
hämähouk, Fin., Karel. hämähäkki "spider" Kurd. hebhebok "spider"
hämär "dusk", Fin. hämärä "twilight" Kurd. semer "dark"
heńktä, Fin. hengittää, Est. hingake "to breathe" Kurd. henase "breathe"
hered "rapid" Kurd. xerez "speed"
hobdä "to powder" Kurd heweng, Tal həwəng, Gil hawang, Pashto hawanga "mortar". hirnaita, Fin. hirnua, Est. hirnuma "to neigh" Kurd. hîrîn "neighing"
ijastus "joy" Kurd. e'ys "joy"
izo "cute", Fin. ihana, Est. iha "wonderful, beautiful"; курд. e'zim "beautiful"
kanz "family", kund "community" Numerous Iranian kand, kant, gund "village, town". kezr "wheel" gerd – the root in many words of Iranian having the sense "to turn", "neck" a.o. kurn "gutter, chute" Kurd. cirnî "trough"
opak "fearful" Gil bеk, Kurd bak, Taj bok "fear"
pirpitada "to shake" Kurd. pirtîn "trembling"
rusked "red", Est ruske, Fin ruskea "brown" Pers räxš Tal rəš Yagn raxš a.o. "red"
t’üukta "to drop" Kurd tika, Gil tikkə – "drop"
toh’ "birch bark" Kurd tûz, Pers tus; Taj tús "birch"
Iranian-Mordvinic linguistic connections are known better than the Iranian-Veps ones, although they are usually considered within the framework of the relations of the Finno-Ugric languages with Indo-Iranian, and sometimes even appear only Indo-Mordvinic or Indo-Hungarian parallels without Iranian matches. 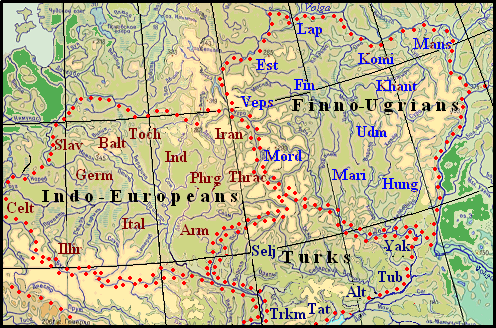 It makes an impression of the same position of the Indian and Iranian languages to Finno-Ugric. This approach reflects the fact that modern linguists are in thrall to old ideas and conclusions, formed back in the 19th century on the basis of the first general research and unsubstantiated concepts, when it was considered self-evident the existence of the Indo-Iranian community. Here is a typical example of such a review: "Contact and even ethnic mixing of the Indo-Iranians with the Finno-Ugrians continued in the forest-steppe zone of Eastern Europe during the whole time" (HARMATTA J., 1981, 79). However, when considering the Indian-Finno-Ugric and Iranian-Finno-Ugric linguage relations separately, the presence of a match between, for example, the Mordvinic and the Indian words, such match can be found also in Iranian. This is understandable, since the area of the Iranian language was closer to the Mordvinic Urheimat than the area of the Indo-Aryans. The areas of the Kurdish and Talysh languages border the area of the Mordvinic language. Accordingly, of all Iranian languages, except Ossetian, Talysh and Kurdish have the greatest number of common words with Moksha and Erzya languages ​​- 62 each. In Ossetian, there are 67 such words, but some of them come from the times of later language contacts between Mordvinic and Ossetian ancestors in the Scythian time. It should be noted, on occasion, that the numerical data presented here on the connections of individual pairs of languages ​​do not exhaust their present number and are used only before comparison between themselves, being taken from the same representative sample of family. With an increase in the sample size, we will receive new data that should maintain its ratio. Examples of separate connections between the Talysh and Moksha and Erzya languages ​​are given below. Erzia torkhtav "turbidmuddy" – Gil. tarik, Pashto tаrik, Tal. toik "dark". Calculations of lexical matches individual Finno-Ugric languages ​​with common Turkic lexical fund gave the following results: Mari – 55 matches, Hungarian – 41, Udmurt – 32, Mordovia – 29, Khanty – 22, Komi – 21, Estonian – 21, Finland – 17 Veps – 14, Mansi – 14. In addition, Mari and Hungarian languages have a very large number of isolated lexical parallels with some Turkic languages, they are present also in the Mordvinic and Udmurt languages. Most of them were borrowed from the Tatars, Chuvash and other Turkic languages in later and even relatively recent historical times (DEÁK SÁNDOR, 1961). 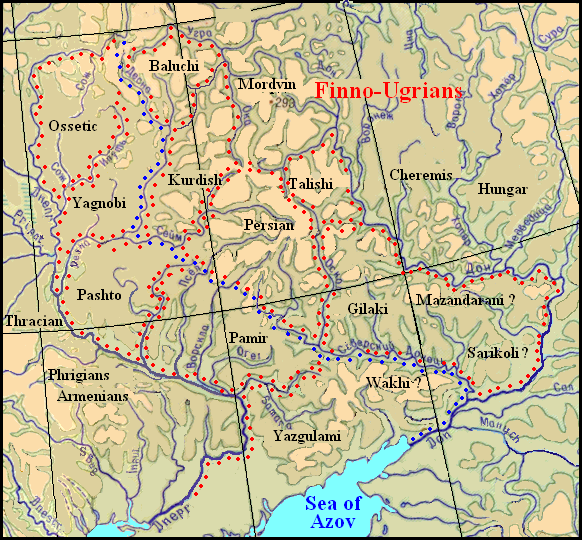 It makes no sense to give examples of numerous Finno-Ugric-Turkic correspondences, since in most cases it is almost impossible to separate ancient and later borrowings. However, the possible mutual correspondences of the Hungarian and the Yakut language can not be explained by later borrowings, since in historical times the ancestors of the Hungarians and the Yakuts had no contact with each other. More than that – in accordance with now existing notions of ethnogenesis of the Magyars and Yakuts – they never could contact at all. If the ancestors of the Hungarians and the Yakuts, indeed, as shown on the map, inhabited neighboring habitats, some traces of mutual contacts should have left in their languages and they can be found. Particularly convincing can be separate Hungarian-Yakut matches without correspondences in other languages. Interesting match according to A. Ron Tas is given by M. Erdal – the Hungarian expression "horse of color sar" corresponds to Yak. ās in the same sense (the initial s disappears sometimes in the Yakut language and s ˂ r) and he emphasizes the geographical remoteness of these languages (ERDAL MARSEL, 2005, 130). Other examples are as follows: Hung. örök "eternal" – Yak. örgö dieri "long", Hung. hiúz "lynx" corresponds well Yak. ÿÿc "lynx". Last Hungarian word is noted in Etymological dictionary (ZAICZ GÁBOR. 2006) as "Ismeretlen eredetű" that is of uknown origin, but there are other Hungarian-Yakut matches: Hung. homok "sand" – Yak. qumax "the same", Hung. hattyú – Yak. kütän "heron". The last word meaning "swan" is present in the Uzbek, Kyrgyz, Kazakh, and in the sense of "heron" in the Khanty and Mansi languages. Areas of all these languages are very close to each other. Of course, other Hungarian-Yakut matches can be found too. The close proximity of the Finno-Ugric and Turkic spaces is also confirmed by the known common Turkic-Finno-Ugric grammatical features such as, for example, vowel harmony, lack of genders, expression of possessive by personal endings, adverbial relations by postpositions instead of prepositions, etc (DEÁK SÁNDOR, 1961). The number of Indo-European-Türkic matches in the Armenian, Greek, Germanic, Baltic, Indian, and Iranian languages is about the same and counts two or three dozen words. Türkic words in Slavic languages are of later origin (MENGES KARL H., 1990: 117). The Armenian language has more than two dozen isolated matches to Türkic roots. Some deal of them might have been borrowed already in historical times from the Turkish and Azerbaijani languages, but among them are which shows very old borrowing by their sound structure. At first it is Arm. antař "forest", which exactly corresponds to Gag. andyz "grove of bushes". The issue of mutual crossings of r and s, z in Türkic languages, known as the phenomenon of the rhotacism-zetacism, is very complicated (see. The Hypothesis about the Nature of the Rhotacism and Zetacism in the Altaic languages), we will consider it later, but these phenomena have already occurred in prehistoric times. Hr. Acharyan in his etymological dictionary, without considering the possibility of Turkic origin of the Armenian word, supposed that it derived from the Indo-European root der-, meaning "a tree", and gives to it a parallel in Sanskrit – vanatara (ACHARRJAN HR. 1971). However, the question of the origin of the word in this case is not important, important for us is the presence of the Armenian-Gagauz parallel. Other Türkic languages also have words andyz but of different sense (eg Balk, Bashk, Kum andyz "the plant Carlina"). The similarity of the senses of the Armenian and Gagauz words may indicate the ancient Armenian-Gagauz (Oghuz) contacts, when the ancient speakers of the these languages populated neighbouring habitats on the left bank of the Dnieper. The boundary between them run either on the Psel or on the Sula River. The boundary between steppe and forest-steppe goes along the Psel River, so perhaps this river separated the cattle-breeding nomadic Oghuz from the hunting tribes of the ancient Armenians. Those ancient contacts are also confirmed by the isolated pairs of Arm gjul "village" – Gag küü "village" and Arm gor "lamb" originated which from the Türk. gozy/kuzy "lamb", as well as some other parallels. Taking into consideration that the location of the Armenian Urheimat in close proximity with Türkic region (Birnbaum uses instead of "Türk" adopted in the West, the term "Turko-Tatar" or simply "Tartar" – VS), one can just understand the reason of ancient Armenian-Türkic relations. Türkic influences extended, obviously, not only to the neighbouring areas but even further, down to the settlements of the ancient Italics and even Greeks. The area of uprising Italic language was located not far from the Türkic region on the right bank of the Dnieper, so Latin words of unknown origin can have matches in the Türkic languages. The Türkic-Italic lexical parallels have sometimes match and in the Greek language. Türkic influences on Greek are evidenced also by other facts. Greek suffixes of oncoming and remove (-de and -θen) perform the same function as Türkic postpositions -da, -de and -dan, -den applied for the formation of Locative answering the question where? where from? Separate Greek-Türkic lexical relations are scanty and this is understandable because the Greek area was separated from the Türkic territory by the Armenian area. Therefore Armenian as mediator between the Greek and Türkic languages could have correspondences to Greek-Türkic lexical parallels. In general, we find, comparing with Indo-European and Finno-Ugric languages, a much larger number of common Türkic words with meanings that show a higher level of culture and social relations of the Türks. There are very little material evidences of the ancient Turkic culture due to the fragility of the raw materials used – felt, leather, wood, and furs, but the features of the Turkic languages allow us to properly estimate the culture of the Türks. In particular, the existence of a developed farming and especially cattle-breading at Türks is evidenced by such common Türkic words: ajgyr "a stallion", akja "money" (the primary meaning, apparently, "cost", "price"), alma "apple", altyn "gold", arpa "barley", at "a horse", bajtal "a mare ", balta "an ax ", beg "lord", boz "an awl", bosaga "threshold", bög "dam", buga "a bull", buzagy "a calf ", geči "a goat", gemi "a boat", dary "millet", demir "iron", ejer "a saddle", inek "a cow", it "a dog", jaby "a horse", jaj "a bow", jal "a mane", jelin "udder “, jigit "rider", jorga "amble", kazan "a pot ", kamčy "a whip", kiš "to neigh", kömür "coal", köpür "a bridge", kul "a slave", kürek "an oar", mal "cattle", öj "home", teker "wheel", tojnak "a hoof ", ujan "bridle", üzenni "stirrup ", etc. Perhaps some part of these words, but very little, has been spread to all Türks in later times, but the vast majority of words having similar meaning in Indo-European and Finno-Ugric are spread in no more than two or three languages. The explanation for this may be the geographical features of the Türkic areas provided not only more favourable conditions for development of agriculture and livestock, but also opportunities for closer contacts with the ancient agricultural cultures of the South Caucasus and Asia Minor. Learning from their agriculture, Türks sharer obtained experience further to the northwest and northeast. This is evidenced by some of the lexical data, as the spread of cultivated plants is mainly accompanied by borrowing their names. Thus, Gr. αλφι, Alb el'p "barley" originated from Türkic arpa "barley." Sir Gerard Clawson suggests that the Türkic word can be borrowed from the Indo-European . (CLAUSON GERARD, Sir. 1972). This view is connected with the idea of Altaic Urheimat of Türks and that they allegedly could not engage in agriculture before the Indo-Europeans. The word arpa as the name of barley is common in Türkic languages and was also borrowed by some Finno-Ugric people (Hung. árpa “barley", Mari. ärva "chaff"). This word is present in only two Indo-European languages, Greek and Albanian. Finno-Ugric neighbours of Türks have borrowed from them, together with millet, and its name: common Türk. dary "millet" – Hung. dara "grits", Mari. tar "millet". But the Türkic word itself apparently comes from Georg keri "barley" (Abkh. a-k'ar). In addition to barley, north-eastern neighbours of the Türks borrowed from the oats and onion. Common Türkic sulu/sula/suly "oats" (from the Georg svili "rye") have matches in Mari. šülö "oats", Mord. suro "millet", Khanty sola "oats". Türkic sogan/sugan "onion" has such matches: Hung. hagyma, Udm. sugon, Mari. šogan, Komi sugon "onion". These loan-words are uindisputable, but to assume that the time of borrowing refers to the appearance of the Türks in Europe only in historical time, means to recognize the cultural backwardness of the Finno-Ugrians who allegedly did not know agriculture until the end of the first millennium AD. Indo-European and Finno-Ugric horse names are borrowed in different forms from the Turkic languages, which use two names derived from the OT. at and jaby. J. Pokorny saw the origin of Indo-European names of horse in PIE *ekuos. However, taking into account the Gr. ιπποσ, Arm ji(p), Celt ebol, it is reasonable to argue that these names of a horse, as well as Latin. juba "a mane", have been directly borrowed from Türkic. On the other hand, the presence of sibilants or guttural in horse names in other Indo-European languages (Latin equu, Lit ašwa, Ir asp, Toch. yakwe) compel presuming possibility of different ways of penetrating the Türkic original word in the Indo-European community. In the Finno-Ugric languages there are also horse names dating back to Turkic jaby, but their paths of penetration are also different. Fin. hepo (diminutive of it hevonen), Est. hobu, hobune, Veps., Karel. hebo were borrowed through the Greek (ιπποσ), Mari choma and Komi chan', both "foal", were borrowed from the Turkic directly. No doubt the first product of exchange was the salt, because its deposits were present not everywhere, but need for salt increased in the Neolithic Age in consequence of the increasing role of plant foods in human diet. Other items of exchanging were livestock, dried and salted fish, tools and handicrafts. This is evidenced by words of different meanings which existed in the western Türkic languages and in the language of the neighbouring people and which can be combined by total sense "commodity, an object of exchange". Actually, this word is just tovar “a product” that has in the Armenian language a form tavar meaning "sheep", "flock of sheep". The Türkic languages have such forms: Kum tuuar "flock of seep", Tur tavar "property", "cattle", Balk., Kr-Tat. tu'ar "the same", Chuv tăvar "salt", tavăr "to return the debt", "revenge", "answer", etc. Chuvash words are very significant. The Chuvash ancestors, that is the Bulgars settled area close to the Gulf of Siwash, where long existed salt business. Thus, salt was for the Bulgars the main item of export therefore obtained meaning "commodity". The second Chuvash word stays semantically and phonetically a bit distant. But in principle, at first it could mean "to pay back", "to offset" that is semantically close to the "price" that could evolve from the meaning of "product exchange". Many Iranian languages have a word tabar/teber/tevir "an ax", and the Finno-Ugric words of this root have a meaning of "textile" (Saam tavyar, Mari tuvyr, Khanty tagar). Obviously, they all had the same origin as the instruments of labour, as products have been traded. The Slavic tur “aurochs”, Lat taurus, and Gr. τυροσ, "ox" have been referred here though competent professionals (Vasmer, Walde and Hofmann, Menges) of these relationships hold back. At last, Ger teuer, Eng. dear, Dt. duur) can be referred here too. Türkic cultural influences were expanded mainly in the Finno-Ugric areas, and wider on the left bank of the Dnieper. In addition to agriculture terminology, the Finno-Ugrians and Indo-Europeans took from the Türks the names of some household items, weapons: common Türkic balta (old form survived into the Chuv purta) "an ax" have such matches: Hung bárd "an ax" (balta is late loan-word), Komi, Udm purt "a knife", O-Ind. parasu, Toch peret (Osset färät "an ax" is probably taken from Tocharish), Yazg parus "an ax", Gr. παλτον "a spear, dart", Lat barda "an ax", bardicium "a spear, hatchet", Ger Barte "hatchet", O-Sax barda. Common Türkic damar "sinew" was transformed into other languages in words meaning "string", "an arrow" "a spear", etc: O.Ind tomara "a spear, dart”, Khanty tamar "a blunt arrow" (for a squirrel, so as not to spoil the pelt), Veps tomar "an arrow", Osseti tomar "to direct" (from "an arrow" – V. ABAYEV), maybe Gr. τομοσ "acute"; common Türkic čana (also Georg čana) "sledge", čanah "jaw" have such matches: Saami soann, Est saan, Mansi sun, Hung szán, Osset dzonyg "sled", Arm sahnak. K. Menges asserted the last word was common to the whole northern part of the Nostratic area (MENGES K.H. 1979: 205). Türkic loan-words on agriculture in Indo-European are very rare and on livestock industry almost none at all. However the Finno-Ugric languages have loan-words more concerned agriculture than livestock. For example, one can say only about Türk. ökuz/öguz/öküz (a proto-form *ökör) presented in Hung. ökör. We can draw two conclusions from these facts. First, before moving to Eastern Europe, the Indo-Europeans, Türkic and Finno-Ugric peoples were already really familiar with the basic types of domestic animals, and, secondly, the Indo-Europeans, in contrast to the Finno-Ugric peoples, have yet another source of cultural influences except of Türkic area. The possibility of the existence of such a source is said for example, the Indo-European and Türkic names of an apple as the fruit of the cultivated plants, which have reason to compare. Türkic alma "an apple" was borrowed in the Hungarian language in the same form, it takes the form ulma in Udmurt , and umar’ does in Mordvinic. An undisputed name of an apple and an apple-tree, common for the all Indo-European languages is absent. The closest to Eastern Europe centre of the origin of apple trees lies in the Caucasus and Asia Minor and obviously this species does not grow in Eastern Europe at the time of arrival the Nostratic tribes there, but they could not bring it with them as yet not engaged in the cultivation of fruit plants. It is therefore very likely that the name of an apple and an apple-tree was loaned in the Türkic and Indo-European languages at a time when the fruit was brought to Eastern Europe by immigrants from Asia Minor or the Caucasus later. The Indo-Europeans had for the name of apples and apple trees the PIE word *abel (cf. Gmc *apli, Slav. ablŭko, Lith. abuolis, Lat. place name Abella, Celt. avallo, aval). The Greeks called apple μηλον and apple-tree did μηλεα, in Albanian apple is named molle; Lat malus, Hittite šamalu “apple”. Maybe Skt. ambla "sour" can be referred here too. T. Gamkrelidze and V. Ivanov derive the proto-form of Indo-European names for apple as amlu and do not exclude their relationship with Trc alma (GAMKRELIDZE T.V., IVANOV V.V. 1984: 639). In view of this all, the decision of the origin of the name of apple in the Indo-European, Türkic, and Finno-Ugric languages can be that way. All the mentioned names were taken from an unknown language, whose speakers live somewhere close to areas of the Türkic and Indo-European tribes (the Hungarian and Udmurt words were borrowed from Türkic and the Mordvinic one was from an unknown Indo-European). The only one place, equally close to these two areas, is the right bank country of the Dnieper River, the area of spreading the Tripilla culture in the 5th- 3rd mill BC. Assuming the Semitic origin of Tripoli, we can search for words in the Semitic languages that are similar to the Indo-European and Turkic names for apples and apples. Such a word samar is found in Arabic language meaning "fruit". Then, if you take into account the Hett. šamalu, a common proto-form for Indo-European and Turkic words could be *hamal, close to the Arabic word, and Trypillians could also have a similar name, which Indo-Europeans and Turks borrowed from them with fruit together. This issue is considered separately in the section " Ethnicity of Trypillians". As we see, the known Russian turkologist L.N. Gumilyov was absolutely right when, noting the high cultural level of the Turkic Kaganate, he assumed the "ancient traditions and deep roots" of the steppe cultures. At the same time, more than materiak culture, he was amazed by the complex forms of life and social institutions of the Turks (el "a tribal union", hierarchy of ranks, military discipline, diplomacy etc) together with "a well-developed worldview opposed to the ideological systems of neighboring countries" (GUMILEV L.N. 2003: 7). Nevertheless, we must recognize that in the conditions of the steppe the Turks could not lay a socio-economic base under a solid state, similar to those that the neighboring nations had at various times – the Chinese, Iranians, Arabs, Slavs. All their state formations did not differ in durability and were destroyed due to internal contradictions, often by the personal character of their leaders. Despite the high level of their culture, Türks borrowed a lot from their Western neighbors Trypillians, what is discussed in the sections "The Names of Metals in the Türkic and Indo-European Languages" and "Development of Merchandise in Eastern Europe at Prehistoric Times". From the Northern neighbors Türks borrowed a few. Probably, the Indo-Europeans were the first in Eastern Europe begining to fatten domestic pigs, what might be indicated by the names of two Indo-European names of pig: *sûs and *porќos. One of them was borrowed by Türks: Chuv sysna, Kaz. šoška, Khak soskha, Kyrg čočko and Finno-Ugric peoples did the second one: Fin. porsas, Udm. pars, Komi pors, Mansi purys all meaning "a pig". In the nomadic way of life, the Turks could not breed pigs that are not suitable for migrations, but the Turks knew this animal and, obviously, got to know it from Indo-Europeans. The Turkic languages have words of another root for naming name a pig: Turkm., Kirg. doŋuz. Gag., Tur. domuz, Kum. tonguz a.o. This word is absent in the peripheral Turkic languages – Chuvash, Tuva, and Yakut. The carriers of these languages were the first to leave their ancestral home, while the rest of the Turks remained in their places and, perhaps, began to breed pigs following the example of Indo-Europeans. The origin of the word remains unclear. There is an assumption that it is based on toŋ "large, strong " (SEVORTIAN E.V. 1980, 268).When meeting a domesticated pig from Indo-Europeans, the Turks could borrow an Indo-European word for it, for example, a similar dunč' (դունչ) "mug". There is in the Vepsian language the word l'evaš "a lttle pie with filling" and in Finnish leivos "cake". These words are very similar in form and content to the word lavaš "pita, pitta bread" spread in the Caucasus and Central Asia .The Ossetians have lawyz "a fritter" and lawasi "pita". V. Abaev considered these words borrowed from some Turkic (А. ABAYEV V.I., 1959-1989). However, it is noted in the Etymological Dictionary of Turkic languages that the word has no recognized etymology (А. SEVORTIAN E.V. 2003, 5). Other Iranian languages have similar wird too (Kurd. lewaş "pita", Afg. ravaš "bread", Pers. lävaš "pita" etc. There is reason to believe that Iranian, Vepsian, and Finnish words have Germanic origin. Ger. Laib "loaf", Eng. loaf, Sw. (Dial.) lev, Got. hlaifs originate from GMC. *hlaibas. Derivatives without of initial h could be developed from this form in other languages – Ir. *laibas → lavaš → Veps. l'evaš. The Germanic word is associated with the Greek κλιβανοσ “stove” (KLUGE FRIEDRICH, SEEBOLD ELMAR. 1989: 425). Consequently, when the Greeks still remained in Ukraine, they already knew how to bake bread, and the Germans, along with the appropriate word, borrowed this skill from them. This word spread further throughout the region along with the technology of baking bread. Lit. klaips , Rus. “khleb” and other Slavic words refer to this root. Without a doubt, the Slavs borrowed the word for bread from Goths, along with many others, even in those ancient times, but not when the Goths settled in the Black Sea region. Tne Iranian-Germanc vocabulary has also other common words. For example, the name of sour cream, butter (Ger. Rahm, OMG. rjúmi, OE ream , Avest. raogna, Afg. rogan, Yagn. rugin, Kurd. rûn, Tal. rüən "butter"), the name of a window (Ger. Fenster, OE fenester), considered to be borrowed from Latin (fenestra), but similar words are present in the Iranian and Albanian languages (Kurd. pencere, Pers. pänj'äre, Alb. penxhere "window"). Of course, not only words to refer to any distinct items spread throughout the all certain space but also for the designation of a broader concept. For example, Eng turf, Sw. torva "peat" have matches in Alb. turbi "peat", Pers. turb "peat", Afg. tarma "swamp". V. Abayev put in this line also Osset. tärf "lowland", Lit. tаrpas "interval" and added Thrak. tarpo (parhaps from Tarpo-dizos) "swamp" and Toch. tarpo "swamp". Perhaps the Slavic * tarva "grass" also comes from here (M. Vasmer takes it out of * truti "to use", "to waste", which are a little further semantically). The word in forms tart/turt/turš "sour", "bitter" are present in this space. Here are some examples from different languages: Alb. tarthё, Eng. tart, Pers. torš, Kurd. tirş, Tal. təlx, Let. sùrs, Osset. tyrty (barberries) etc. You can also trace the development of semantics and spreading an old substrate IE root lard/lurd, presented in Lat. lаrdum "fat", Arm. ljurd "liver", Gr. larinos "fat, greacs". Eng. lard is cosidered to be loan-word from Latin, although it can be Italic substrate word, as the Anglo-Saxons populated the same area after the Italics. Further, the semantics of the word meaning "fat" has developed in the direction of "dirty". This sense has Sw lort "mud". From Germanic areas the word with this sense spread eastward into Iranian areas (Pers. lert "sediment", Tal. lyrt "mud"). A list of such parallels can be continued, even though many of conformity may remain mysterious. Germanic languages had a word *gabūr "a dweller, master", which is kept in Ger. Nachbar, Eng. neighbour originated from *næhwa-gabūr literally "a nearest dweller" (А. KLUGE FRIEDRICH, 1989). A group of Iranian words was borrowed from Germanic: j’awar/ j’ewar "a neighbour", from which Mord. shabra "the same" was loaned. Of course, it is an errant word coming by complex ways in many languages: Rus. shabior "a neighbour", "a friend", Bel. siabr "a fiend", "a brother" and other dimilar word in the Ukrainian, Slovenian, Serbian languages. There is also a group of ethnonyms like Sabirs, Savirs, Suvars, Serbs, Severiani. There is no doubt that the cultural ties of the population of Eastern Europe were not limited to the socio-economic sphere, and exchange of achievements in artistic and creative activities had to exist. This is a topic for specialists, but linguistics can give certain material. For example, the origin of the name of a musical instrument bandura is associated with the Lat pandura and Gr. πανδουρα "cittern" and its source are looked for in Lydia. (VASMER MAX. 1964. Volume 1, p. 120). Obviously it was not found, as the roots of words are in the language of the ancient Bulgars, as it is evidenced by Chuv. păntăr-păntăr – imitation of strum, strum of strings, păntărtat – 1. "to strum", produce strumming sounds (of a stringed instrument), 2. "to pop", "to rattle" (on drums) and like. What Chuvash words have a more common sense, means that the stringed musical instrument was borrowed by the Indo-Europeans (Greeks and / or Italians) from the Bulgars, and not vice versa. The peoples of the Caucasus have names for musical instruments like the Latin word pandura, but the source of the borrowing, just as words of bandura, is difficult to define. Musical instruments with a similar name – Fr. tambourin (long drum), Tat. dumbra "balalaika", Cr.Tat. dambura "guitar", Tur. tambura "guitar", Kazakh. dombra (a type of balalaika), Mong. dombura are used by many Asian and European peoples. It is believed that their names have Arab origin (Ar. tanbūr "stringed musical instrument"). However Chuv. tĕmpĕr-tĕmpĕr "imitation drumbeat", tĕmpĕrtet "to rattle" (of drum) cast doubt on this, since the similarity of words păntăr and tĕmpĕr speaks to their common Türkic origin. As you can see, even in those ancient times, people in addition to the security concerns of their existence needed to be fun, but they fun not only music, but also games, one of which was the ball game. The antiquity of this subject for the game shows the spread of the same name for a broad area in the time when the Iranians are still living in close contact with the Germanic tribes. The word top/tob meaning "a ball" can be found in many Iranian and Turkic languages, it is also present in the Moksha, Ersa, Mari, Albanian languages, and probably even in the other languages ​​of the region (in Udmurt töb "skein"). The meaning of this word in the German and Chuvash language can explain to us even manufacturing technology of balls. OMG. toppr means "topknot", German Zopf of the same root – "female braid", the Chuvash language has tăpka "bundle, clump" . Consequently, balls were made from hair, wool and obviously sewed round by skin.